This new project is an eight-storey boutique condo in the pre-construction phase, situated in Toronto’s West Queen West neighbourhood and developed by Skale Developments. 1181 Queen Street West is currently slated for a 2021 occupancy. This trendy mid-rise will sit right at the southeast corner of Queen and Sudbury Street, across from the renowned Gladstone Hotel. It calls for a proposed 15 storeys, made up of a three-storey base and an eight-storey mid-rise. 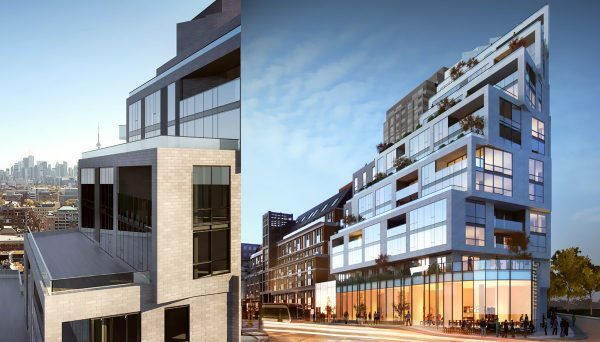 In total, there will be 146 residential units and 7,696 square feet of retail space on the ground floor, with a residential lobby off the quieter Sudbury Street and retail access off Queen. Four levels of underground parking will provide 89 spaces for vehicles and 110 spaces for bicycle storage. The developers are proposing 4,122 square feet of indoor amenities on the building’s second and floors, including a lounge and fitness centre. In this proposal, the indoor amenities on the second floor would connect to a 1,280-square-foot outdoor terrace. The unit mix will be a variety of layouts ranging from one-bedroom to three-bedroom plus den. The modern development will boast luxurious, solid-core suite entry doors, a variety of 9” and 10” high ceilings, and contemporary fixtures with brushed nickel hardware. Porcelain tiles, quartz countertops, electronic access, expansive open concept kitchens are all finishes residents can look forward to. Additional sleek touches include sliding doors, and a stackable electric washer and dryer. Bathrooms are complete with a custom mirror over the vanity in the bathroom, ceramic tiles, pressure balanced valves in the shower and tub, and white modern acrylic tub. Surveillance cameras in select areas of both the building and underground garage will be accessible as well as an electronic access control system for common areas as well as recreational amenities, and the parking garage. Skale Developments has outdone themselves, again delivering expert design that proves themselves deserving of their reputation for classy and elegant buildings that still compliment the existing fabric of their neighbourhoods. West Queen West continues to be one of the most popular neighbourhoods for artists and young professionals. Both quirky and trendy, this part of the stretch is designed as a “regeneration area” in the City of Toronto’s official plan. The city describes these areas as mixed-use, housing a combination of commercial, residential, live/work and institutional buildings. The “regeneration” designation means they represent an opportunity for growth in the city, which makes them great for investors looking for long-term appreciation. Though the main portion of West Queen West is lined with historic brick walk-up apartments and a selection of bohemian cafes, shops and bars, we’ve slowly been seeing a contemporary touch move into some parts of the neighbourhood. Mid-rise condominiums next door and across the street from the site have seen success, merging modern condo features paired with masonry that reflects the neigbourhood’s vibe. Extremely popular with young professionals looking to rent, this stretch is close to Trinity Bellwoods Park, Liberty Village and The Entertainment District, some of Toronto’s most iconic destinations. Being right on Queen Street is a transit bonus as well, giving residents immediate access to the 24-hour streetcar line. Just steps away, the Dufferin bus will get you to the subway in about ten or fifteen minutes. Driving? The Gardiner Expressway and Lake Shore Boulevard are just minutes away too. We don’t see this eclectic, hip enclave becoming less desirable to live and work in any time soon. With its “regeneration” designation, we’re also expecting some exciting and dynamic changes to the area, making it an equally great location to call home, invest in, or both. Armaan Salek, the founder of Skale Developments brings a varied experience in the construction and development industry to his newest enterprise. 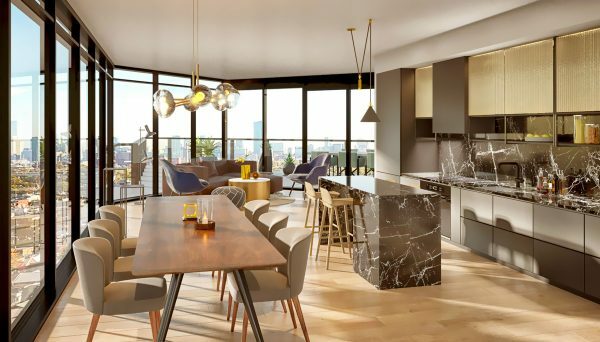 With a foundation building executive townhomes and single-family houses, their first condominium, also a trendy boutique building, sold out in record time and is a hotly-anticipated addition to its east-end neighbourhood. They hope to continue the trend with this new project and we’re excited to see how they continue to contribute to the regeneration of this dynamic stretch. 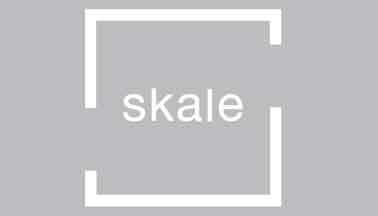 Read more about Skale Developments.